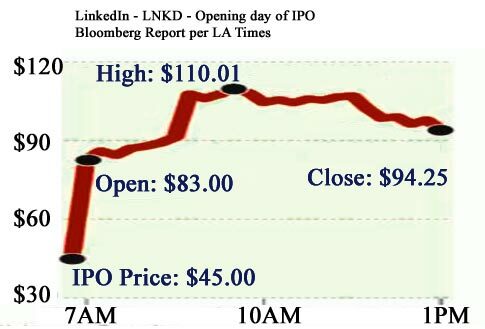 Does LinkedIn IPO Demo The Power of Branding? Tags: branding, Linkedin IPO, Marketing, pest control guy, what is LinkedIN Stock Symbol? What earning potential does the social media site of the business world have? Pro Memberships and Ads. But isn’t the advertising/income potential a problem for other social media giants, say… Facebook? Granted the audience on LinkedIN is much more professional than Facebook. Of course being a professional social media networking site doesn’t guarantee you have business savvy, like “What Price should the IPO open at?” which according to the LA Times cost them $130 million. Ooops. But don’t worry LA Times also quotes the high price at $122.70. Yet they posted a Bloomberg report with a high of $110.01. 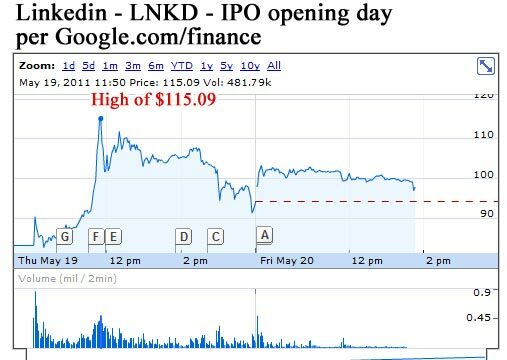 And Google reports the opening day high for LinkedIn’s IPO at $115.09. So what are few number discrepancies…? PEOPLE BOUGHT LINKEDIN PRIMARILY BECAUSE OF A NAME. Many people bought knowing the name would push it, just so they could sell it after the initial jump. Branding. Gotta love it. What is LinkedIn’s Stock symbol? LNKD. Next question. …..Just add it below. Don’t mind me, just a pest control guy.